The replica of Noah's ark shown above is 1/75 scale. For comparison purposes, both the railroad stockcar and model of the sailing ship Pinta (one of Columbus' ships) are also at the same 1/75 scale model size. Noah's Ark was a large vessel described in the sixth chapter of the Biblical book of Genesis, built specifically to save a remnant of mankind and animals from the flood. Noah was chosen by God and warned of the impending disaster, being given a command to build the Ark to save himself and his family, consisting of eight people, and the land animals from the flood (Gen 6:14-16). At the end of the flood, it ran aground in the "mountains Ararat" (Gen 8:4), where sightings are disputed to this day. Three massive replicas of Noah's Ark exist today, partly or fully constructed: one in the Netherlands, one in Kentucky, and one near Miami, Florida. The Ark was large; in fact, until the launch of the British ship Great Eastern in 1858 the Ark was the largest moving object built by man. The Hebrew cubit was a unit of measurement spanning the distance from the elbow to the tip of the middle finger, or about 18 inches, and based on this measurement the Ark was 450 feet long, 75 feet wide, and 45 feet tall. However, Moses, the writer of Genesis, was educated in the court of Egypt and was familiar with the royal cubit, which was 20.6 inches long, giving the Ark a maximum size of 618 x 103 x 61 feet. The Ark's construction consisted of "gopher wood", a material that is the subject of conjecture today. Scholars have posited a number of possibilities for what gopher wood represents, including mahogany, zebra wood, cambriatic wood, cypress, and ebony. Strong's states that it is an unused root word (גֹּפֶר gôpher) possibly related to either building something from wood, to house in, or a type of tree, leaning toward the cypress. It may also be related to kâphar (כָּפַר), which in the Genesis account (ch. 6:14) specifies "pitch", leading scholars to speculate that the wood involved was from a resinous tree. The "pitch" itself was bitumen, used extensively by the ancients as both a binder and a waterproofing agent. 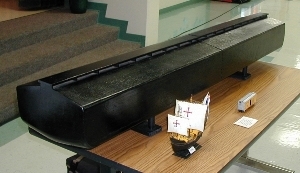 Commonly called asphalt or tar, the material is first heated up to make it more viscous before being applied; Arabic reed boats called kufas have lasted for years after being pitched, and on a similar note it has been recorded that Native Americans also used the pitch obtained from the La Brea tar pits in California to waterproof baskets. There were three decks within the Ark, which were themselves divided into multiple rooms for the housing of Noah and his family, the animals, and food storage. According to Gen. 6:16, the Ark was finished to within a cubit at the top ("...in a cubit shalt thou finish it above"), apparently giving the vessel a cubit-wide opening spanning much of the length of the ship; this may have been the "window" that is mentioned in the King James Version, and translated as an opening for light in other versions. This opening would allow for fresh air to circulate throughout the interior as well as for the collection of drinkable rainwater; it would also be used by Noah near the end of the flood, when he released a dove to see if the waters had abated. Ark construction: Photo of a scaled model at the Creation Museum. This was taken by Conservapedia user TerryH. Though some suggest that this was a reference to human life expectancy post-Flood, others point out that the life expectancy of man did not decline abruptly, but gradually, over at least fifteen generations. So the 120 years might also refer to a prophetic warning given 120 years in advance of the Great Flood. So it can really only be said that it took a maximum of 120 years to construct the ark, from the time God had given him the command to when he actually finished and was in the ship. We are told later that Noah was a "preacher of righteousness", so presumably did not work full-time on the construction of the ark, but also spent time preaching. We also don't know whether or not he employed hired labor in its construction. Research by staff members of the Korea Research Institute of Ships and Engineering, Taejon, showed that the ark "could have navigated sea conditions with waves higher than 30 metres". Noah was instructed, by God, to take aboard the Ark his wife, his three sons and their wives, male and female pairs of all the "unclean" kinds of creatures, seven (or seven pairs) each of the "clean" kinds, and enough food and supplies for everyone (Gen. 6:18-7:3; 7:6, 11). The ark was afloat for about a year, and finally came to rest somewhere in the mountains of Ararat. This is believed by many to be the mountains in modern Turkey which bear that name (Gen. 8:4). If the Mount Ararat in present-day Turkey is indeed the Mount Ararat on which the ark came to rest, then the ark must have been covered, rotted away, moved or disassembled since then because it is not visible on the surface. In 1977, Ron Wyatt promoted a site on the lower slopes of Mount Ararat which he claimed was the remnants of Noah's Ark. However, his findings have since been discredited by a variety of sources including mainstream archaeologists and other Young Earth Creationists prompting Creation Ministries International and Answers in Genesis, two of the world's largest creationist ministries, to make a general statement that Young Earth Creationists should not use Wyatt's claims since they are at best highly dubious. It has been noted by several researchers that the Chinese character for a "large ship/boat/vessel" is a combination of the characters for "boat," "eight" and "mouth/person." Noah, his wife, his three sons and their wives totaled eight mouths/people. Supporters of Noah's ark contend that such a craft was entirely possible for ancients to build and would have been very seaworthy whereas the Epic of Gilgamesh's ark was not seaworthy. The nautical engineering firm Shearer and Associates wrote regarding the ark that it would have been structurally sound and would have had sufficient stability and buoyancy for the cargo carried. a lack of room for all the animals, usually on the basis of the biblical reference to kinds being the same as species. Supporters of the account reject that kinds is to be equated with species, so use a much lower number. The difficulty of the eight humans on board to care for all the creatures on board. The difficulty some animals would have getting unaided to or from the ark, especially those adapted to a specific habitat. Young Earth Creationists have written a number of responses to such criticisms, such as John Woodmorappe's Noah's Ark: A Feasibility Study which argues that kinds is not to be equated with species, and that there would therefore be a much smaller number of creatures on the ark, and that there are ways that the humans on board could have cared for all the creatures on board. Creationary geologists have also pointed out that much of the Earth's geology is sedimentary (water-laid) rocks, as one would expect from a global flood. A study by University of Leicester physicists proves that the Ark is large enough for all the animals it had to carry. Modeling the size of Noah’s Ark Creation 21(1):6, December 1998. ↑ Calculated from length, beam, and estimated draft. ↑ The height of this vessel when in "drydock" was 30 long cubits. ↑ Hong, S.W., Na, S.S., Hyun, B.S., Hong, S.Y., Gong, D.S., Kang, K.J., Suh, S.H., Lee, K.H., and Je, Y.G., Safety investigation of Noah’s Ark in a seaway, Journal of Creation 8(1):26–36, April 1994. ↑ Snelling, Andrew, Special report: Amazing ‘Ark’ exposé, Creation 14(4):26–38 September 1992. This page was last modified on 9 April 2019, at 13:21.